Marist School of Marikina featured a come-from-behind win and clutched the championship from Catholic High School Sibu, 79-71, in their final game in the 2018 Marist East Asia Basketball Tournament (MEABT) that was held last July 19, 2018 at the Marist School Gymnasium. 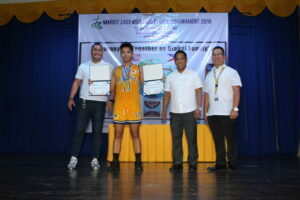 The MEABT named Jan Edric Orogo of Marist School as the Most Valuable Player of the tournament. Marist School entered the championship match without any losses from the preliminary games, even winning by a huge margin against Catholic High School Petaling Jaya last July 17 with a final score of 119-29. But the host team was plagued with misplays in the first three quarters of their final ball game against Catholic High School Sibu. 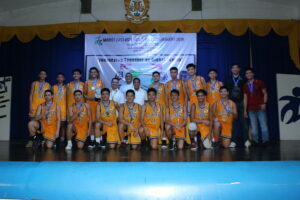 “Their lead only made us more agitated, leading to more errors,” Carlos Manucat IV, Marist School team captain shared. By the end of the second quarter, Marist School fell behind by 12 points, the largest distance they had in the entire tournament. The Malaysia-based team, who was the 2017 MEABT champion, only fielded a total of seven players during the match; but their numerous defensive rebounds greatly assisted their footing in the game. Six of their play ers also scored double digits, ranging from 10 to 15 points. expectations of the crowd made us nervous, but our coach gave us a pep talk about how we should defend our pride as the school’s varsity team,” Manucat said. Indeed, as the last canto came, the Marikina-based squad regained their play, with a crucial assist coming from Matthew Castillo, giving Alfonso Santos a chance for a crucial trey. Jimuel Hinojales led the team with 17 points, followed by 9 points apiece from Manucat, Castillo and Santos. “Our individual skills and talents played a huge role in this game but the biggest strength we had was the hard work we endured and the trust with each other throughout the league,” Manucat explained. Prior to the match, the tournament saw Petaling Jaya grab a win from Notre Dame of Cotabato, 69-65 for the third place in this year’s MEABT. Contributing in the win of the team was Goh Jing Xian with 16 points and Sean Lee with another 14 points. 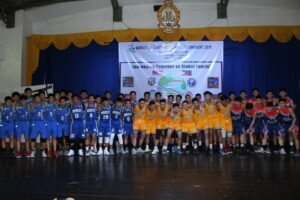 This is the second year that the Marist Brothers organized the tourney, which is committed to build character by practicing sportsmanship, family spirit, camaraderie and harmony among the participating schools. Marist School of Marikina served as the host school this year, with an opening program done last July 17. Present was Br. Robert Teoh, FMS, Provincial Superior of the Marist East-Asia Province who gave the inspirational message in the program.